It’s that time again! Time for my annual “be a better blogger” resolution. You might have picked up on the fact that I’ve slowly been transitioning back into the world of the living, by which I mean the world of the writing, with two whole posts since New Years. This may not seem like much but it’s a vast improvement upon the two posts per month I’ve been averaging these days and I’m determined to keep going. The truth is, I feel better about myself when I blog. I feel more exciting, if that makes any sense, and I feel more thought out, if that makes any more sense. When I don’t write, everything gets all mixed up in my head and I stop noticing things. I stop finding the humor in everyday situations and, well, that’s a very dangerous place to be. In trying to figure out where to take my blog, however, I’m reminded—somewhat ashamedly—of where it’s been and of where I’ve been. Sometimes I look back and want to smack myself. For so many reasons. 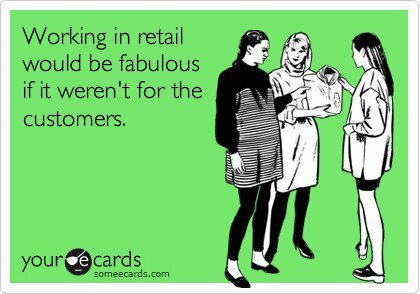 But mainly for working at The Shop as long as I did. “5″ x 7″ I reply automatically and reach for an example. I like the idea of ‘Throwback Thursday’. Plus, this is an AWESOME post. Ah, the joys of working retail. So glad I don’t anymore. Haha, I’m with you on that one, Becky! Thank you for the lovely Christmas card, by the way 🙂 Wishing you and Adam a very happy 2014! I totally understand how blogging helps to clear your mind and find the funny in the world that you’ve experienced, I blog for the exact same reason. Actually, I’ve been blogging since I was 11-12 on and off, and it has always helped me clear my head and actually feel better. I love this story too, I have inadvertently worked in retail (especially as a massage therapist, go figure) and it is a huge headache! Yeah, I started writing a journal when I was around that same age. Most of what I wrote horrifies me but I like to think it was semi-productive as well. Certainly put me on the path to becoming a writer. I had forgotten how funny these were, more-more! Haha, yeah– I was pretty snarky back then.